I've mentioned before, G is giving me "Baby 101" classes because I am SO clueless on baby-related things. One of the things she's taught me is that when baby is hungry - baby gets to eat. But when you're out and about, sometimes that isn't the most convenient thing to do. Who wants to be exposed for the world to see? Baby Bond Nursing to the rescue! Baby Bond Nursing is America's #1 Breastfeeding Accessory. They cover mom, not her baby. Mom is able to maintain her modesty. The baby remains uncovered benefiting from the infinite opportunity to make eye contact, interact, and communicate. After all, dining is social. "I do believe women deserve the right to feel comfortable breastfeeding wherever and whenever no matter what product they do or do not choose to use. I am honored to be able to offer one of the options available to nursing moms." What mother wants to buy expensive maternity & nursing tops that they'll end up discarding? That's a waste of money, and as I've heard, those tops don't exactly make you feel like you look your best. Baby Bond Nursing comes in three designs - Original, Flex & Couture. All designs are 100% cotton and machine washable. The BabyBond Original™ is worn like a sash, functioning like a nursing top. Nurse from the top of your shirt. Separate the layers of fabric to achieve latch on. 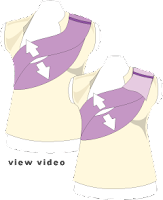 Double panel keeps breast covered above & below. Belly & back remain covered with your own shirt. Built-in 9 x 12″ double layer terry velour burp cloth. Stores in matching pouch and retails for $35. This style is available in three colors - black, espresso & charcoal. The BabyBond Flex™ is worn like a sash, functioning like a nursing top. Nurse from the top of your shirt. Separate the layers of fabric to achieve latch on. Double panel keeps breast covered above & below. Belly & back remain covered with your own shirt. Removable 9 x 12″ double layer terry velour burp cloth. 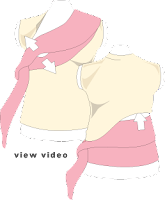 Able to attach any cloth or wear without cloth attached. Stores in matching pouch and retails for $35. This style is available in three colors - chocolate, night & expresso. The BabyBond Couture™ is adjustable creating a custom fit as your body changes after baby arrives. A hybrid between nursing top and belly band, it can be worn to nurse from the top or the bottom of your shirt so it works with your entire wardrobe. 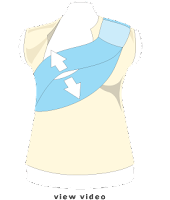 When worn like a sash, it functions like a nursing top. When worn like a belt, it functions like a belly band. Rolls up into self-storing pouch and retails for $35. This style is available in five colors - espresso, hudson, riviera, classic & barcelona. *baby bond nursing donated a couture wrap for g's baby shower. all opinions are my own and no money exchanged hands. thank you to baby bond nursing!